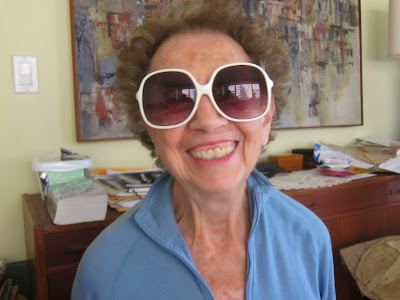 male pattern boldness: Sunglasses for Mom et al. As most of you know, last Sunday was Mother's Day. The holiday has a different flavor now that my mother is living with us, since we see each other every day. Still, we had a delicious brunch on the balcony and took a walk in the neighborhood. 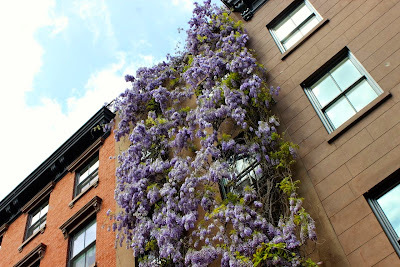 There are a few lovely blocks nearby with gracious brownstones (i.e., townhouses) covered with wisteria vines. When these bloom, it's really a sight to see! 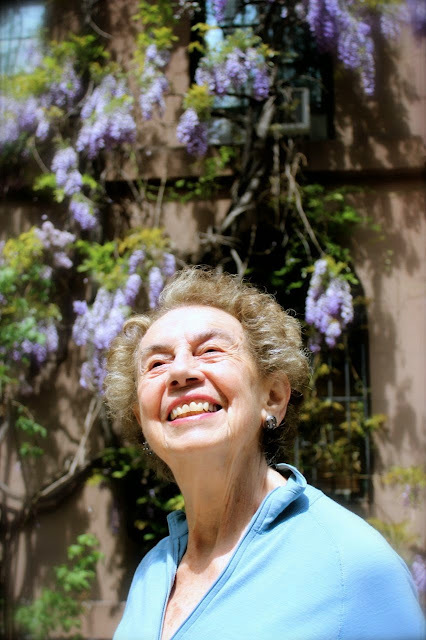 I took a few portraits of my Mom, who (don't tell) turns 85 next Monday. 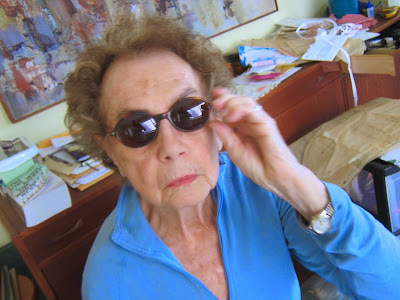 The day was warm and sunny and my Mom told me she wanted to stop in a local drugstore and pick up some cheapie sunglasses. 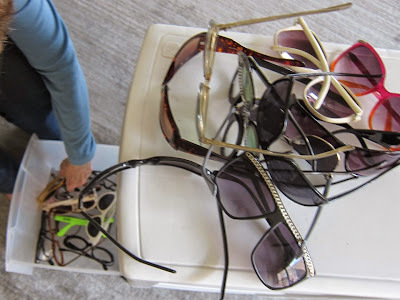 It occurred to me that she might like one of the dozens of pairs I've collected for Cathy over the years. 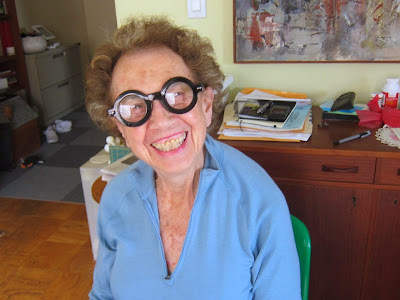 My mom's no Iris Apfel, but she was open to sampling some unusual frames. Which is your favorite? 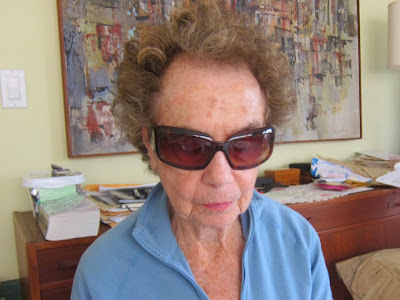 In the end, she opted for black plastic shades from Michael Kors. I approve. 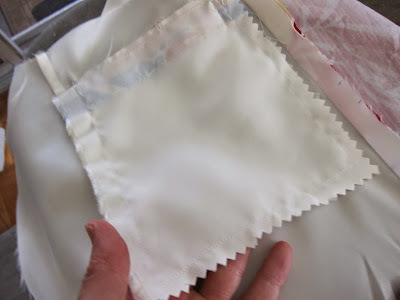 In other news, I continue to work on my jacket, which I think is going to end up as Michael's jacket for reasons I'll explain in a future post. 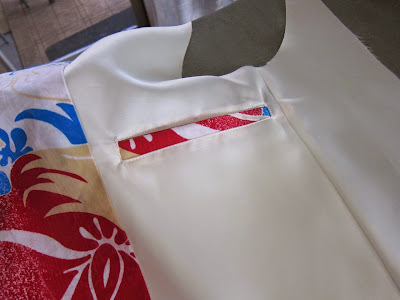 Yesterday I focused on the inside pocket and lining. 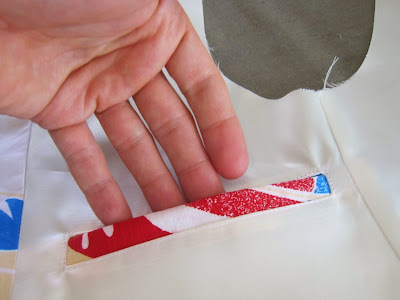 I always forget how much work is involved in making a man's sport jacket. If I remembered I might never start another one: a bit like childbirth, perhaps. On that note, a Happy (belated) Mother's Day to all you mothers out there. A belated Happy Mother's Day to your mum. I think she made a great choice with the glasses. Those outdoor portraits of her are absolutely stunning. You and your mother are adorable! Seriously, she wears sunglasses so well, I can barely choose. I'm going with the cat's eye - and the ones she chose. The third pair and the rhinestone cat-eyed ones! Happy Mother's day a little late. 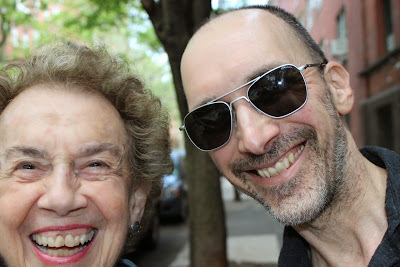 Happy (belated) Mother’s Day to your mom! I like the pair that she chose. 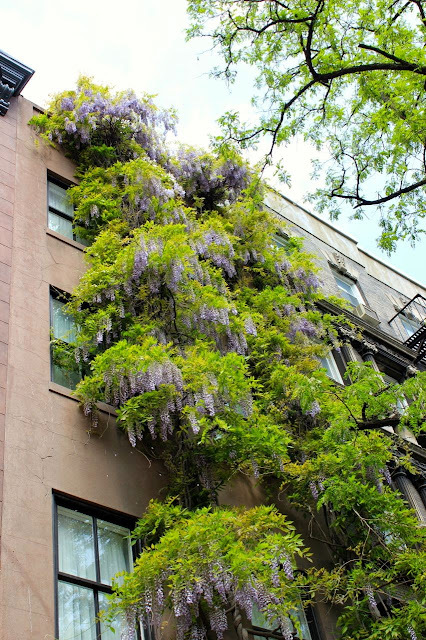 That wisteria vine is amazing. 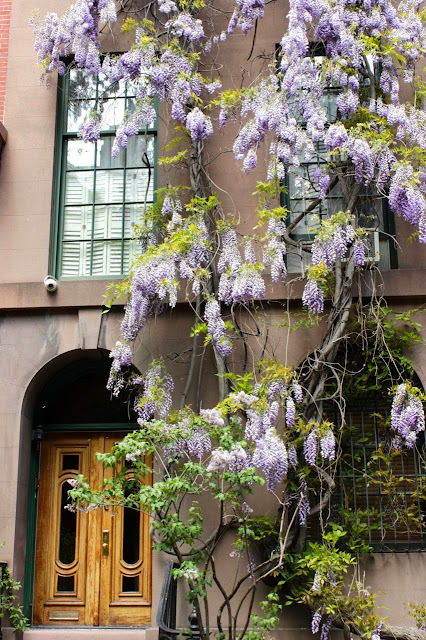 My mother loved wisteria. 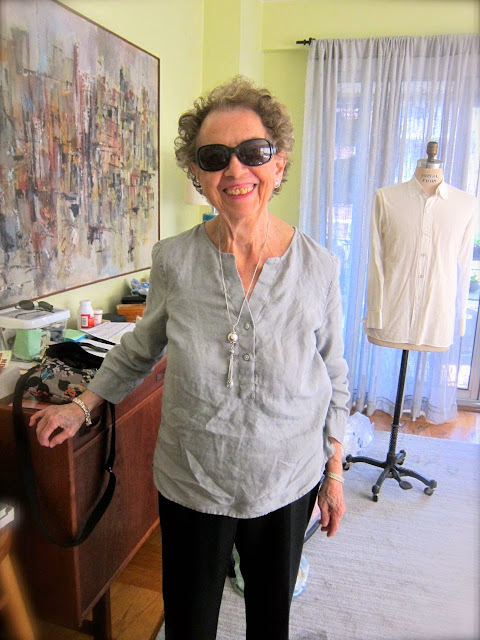 Always so nice to see Mama Lappin making guest appearances on your blog! Your mother is a doll! You are so fortunate, as is she. I caught the tail end of 'How it's Made', where they made a man's suit coat. It was an interesting episode, but nothing like the tailors of old. Wow! 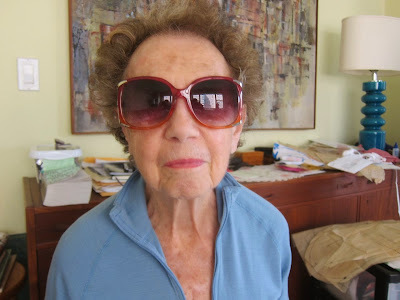 With a little lipstick and some cool shades your mom can pass for 55! She's adorable!! I support her choice...but if they ever break, the rhinestoned cat eyes are an awesome runner-up!!! Great pictures, always a pleasure to read you. Happy Mother's Day to your mom, ours in France is at the end of the month (Father's day is the same day as in the US, go figure..). For the glasses, my favorite are the rhinestoned cat eyes, although I understand her choice and it's a good one. 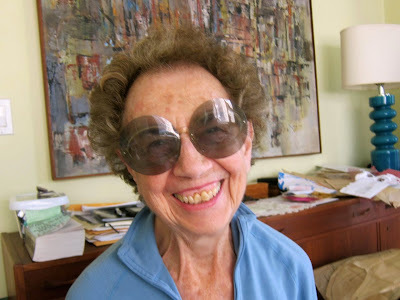 The green catseyes with diamantes - your mom looks very good in those. Cheers Peter. I agree with the other views. Our Mother's Day is in March (UK). Father's Day in June. I love the cat-eye sunglasses on her, but the lens are not really dark enough. My mother's bIrthday is may 18 as well! A lovely Mother's Day post, Peter. She's looking great; happiness is so becoming, isn't it? The pairs I like best are the first two she's modeling but the choice she made is simple, sporty, and chic. It's no wonder where her son gets his style. 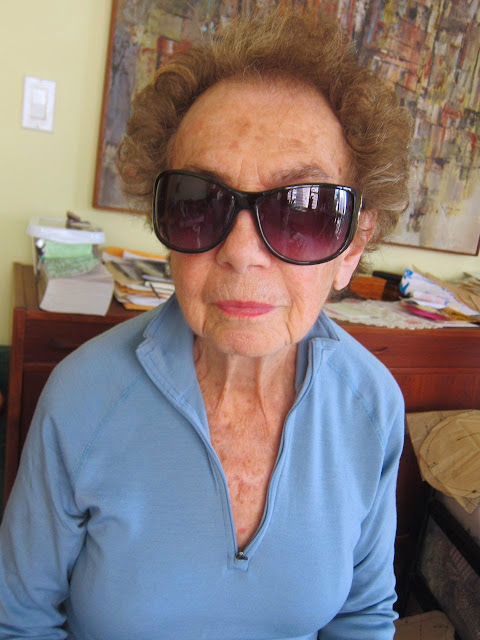 Your mother is a trooper to model all those sunglasses. We will take her to lunch next time we are in NYC. And you, of course. 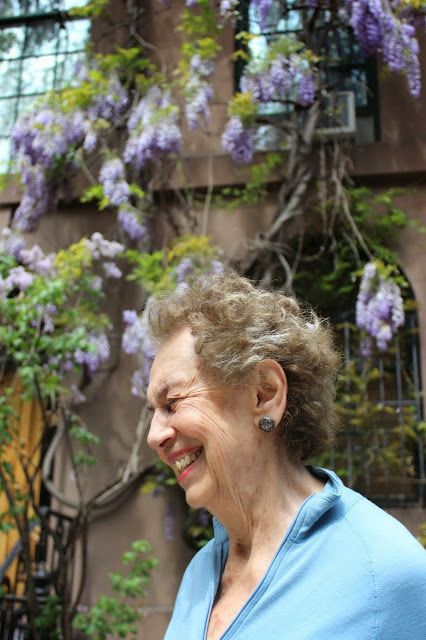 These photos of your mom are wonderful - she looks v happy and healthy. A blessing! 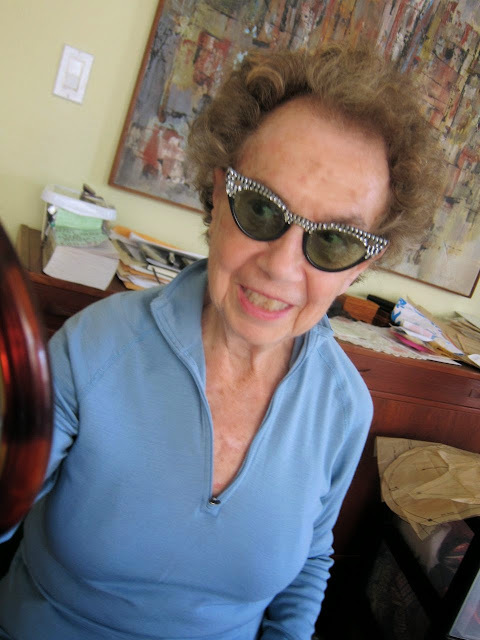 Love seeing photos of your mom. She is so blessed to be able to stay with you. The glasses she chose were great but the red ones - fun, fun, fun!! What fun pictures with your mom stylin and profilin. Can I please have her autograph : ). Fun all around. That is some amazing wysteria, WOW. 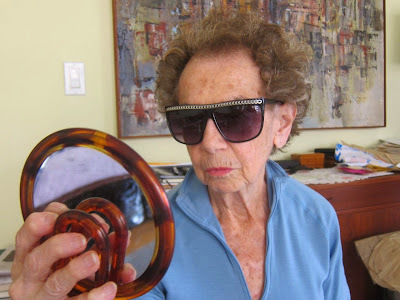 Your Mom looks awesome in the cats eye sunglasses or the ones with the jewels across the top. The ones you chose look great as well. Love your blog. I liked the first goggles. So edgy! What a great Mom you have, and she's lucky to have you.